An overview of Nairobi City. 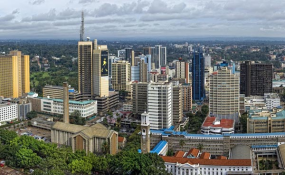 A report by the Economist Intelligence Unit's Worldwide Cost of Living survey says the cost of living in Kenya's capital has risen 13 places compared to the previous year's ranking, placing it at position 69 globally. The report is usually used by companies to help calculate cost-of-living allowances and build compensation packages for expatriates and business travellers. Kenya's inflation dropped to 4.69 per cent last year compared to 6.3 per cent the previous year. Appreciation of Kenyan shilling against the dollar leaves expatriates worse-off because it means less money for them after conversion to the local unit. "Last year inflation and devaluations were prominent factors in determining the cost of living, with many cities tumbling down the ranking owing to economic turmoil, currency weakness or falling local prices," the report says. The findings, based on prices, earnings, purchasing power and working time, ranked Cairo and Lagos as the least expensive cities globally. A June 2015 survey by Mercer's 21st Cost of Living also ranked Nairobi 104 out of 207, making it one of the most expensive cities. For the first time in the history of the Economist's survey, three cities-- Singapore, Hong Kong and Paris -- share the title of the world's most expensive cities. The report found Asia and Europe continuing to dominate the top 10 list.